Эрнест Миллер Хемингуэй (1899 - 1961) - знаменитый американский писатель, лауреат Нобелевской Премии по литературе (1952). Широкое признание Хемингуэй получил благодаря своим романам и многочисленным рассказам и своей жизни, полной приключений и неожиданностей. Его стиль, краткий и насыщенный, сильно повлиял на американскую и британскую литературу ХХ века. Предлагаем Вашему вниманию аудиокниги с текстами - Эрнест Хемингуэй. Прощай Оружие - A Farewell to Arms - The greatest American novel to emerge from World War I. A Farewell to Arms cemented Ernest Hemingway's reputation as one of the most important novelists of the twentieth century. Drawn largely from Hemingway's own experiences, it is the story of a volunteer ambulance driver wounded on the Italian front, the beautiful British nurse with whom he falls in love, and their journey to find some small sanctuary in a world gone mad with war. By turns beautiful and tragic, tender and harshly realistic, A Farewell to Arms is one of the supreme literary achievements of our time. И восходит Солнце - The Sun Also Rises - Is the first major novel by Ernest Hemingway. Published in 1926, the plot centers on a group of expatriate Americans in Europe during the 1920s. 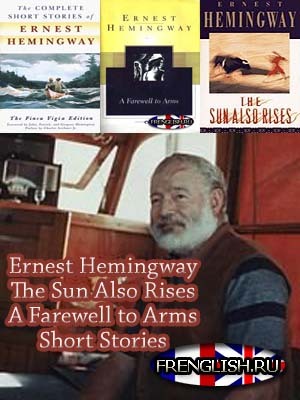 The book's title, selected by Hemingway (at the recommendation of his publisher) is taken from Ecclesiastes 1:5: "The sun also ariseth, and the sun goeth down, and hasteth to his place where he arose." Hemingway's original title for the work was Fiesta, which was used in the British, German and Spanish editions of the novel. Сборник рассказов - The Short Stories - The Short and Happy Life of Francis MaComber, The Capital of the World, The Snows of Kilimanjaro,The Old Man at the Bridge, Up in Michigan, On the Quai at Smyrna, Indian Camp, The Doctor's Wife, The End of Something, The Three Day Blow, The Battler, A Very Short Story, Soldier's Home, The Revolutionist, Mr & Mrs Ellio, Cat in the Rain, Out of Season, Cross Country Snow.